In July 2018, DSV will open a new and modern facility in Ghent, Belgium. The facility has been designed and built to handle all the logistics and distribution challenges within the rapidly changing healthcare industry in Europe. “The last couple of years, we have seen a rapidly changing healthcare market,” commented Nouzha Ouaamar, Global Business Development Director, Healthcare & Life Sciences. 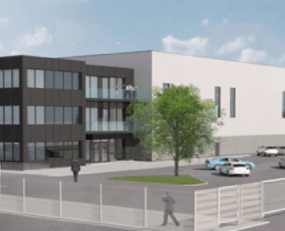 The new facility will be opened in July and is a 10,500 sq m extension to the current distribution centre in Ghent, now measuring a total of 36,000 sq m dedicated to the healthcare segment. The extension was needed as the healthcare industry is a growing customer base for DSV in Belgium. The new facility is fully temperature-controlled securing that the cold chain of the sensitive products is never broken. The cold storage units and packaging setup are fully compliant with international regulations and requirement, including a GMP license to handle repackaging and labelling of healthcare products. Ghent in Belgium is centred in the middle of Western Europe, a prime logistics location with many distribution advantages. Albert-Derk Bruin, Managing Director, DSV Belgium and France, explains: “The distribution centre in Ghent is located close to the Ports of Ghent and Antwerp and Brussels International Airport creating a seamless distribution network throughout Belgium and the rest of Europe.